Hobbies are essential in order to make life interesting and fulfilling. After all, it would be quite boring to simply work all the time and watch TV during one’s off time. Woodworking is an extremely popular and satisfying hobby since it not only eases stress but creates something useful in the end. This article will be looking at a few DIY wood projects for beginners that just about anyone can try. One of the first things that should be made is a pair of saw horses. This is a very helpful project since these horses will be needed for further woodworking projects. They basically enable easy and safe sawing of wood using electrical saws and will ensure that all other woodworking projects are easy to implement. Next, a DIY hanging planter is another simple project that anyone can make. As the name suggests, it is basically a container for plants and can be used as a herb garden. This also makes a great gift and can help to save money on the grocery bill. There are also many artistic options for those who want to create art on the cheap. For example, another woodworking project is pallet wood wall art. All that is needed is some pallets which are usually available for free. The words can be carved out using simple hand carving techniques and can truly create a unique art piece for the home. 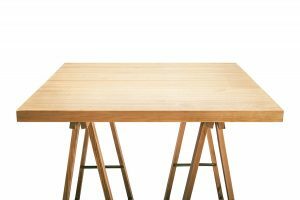 A table is one of the first things that people want to make when they start woodworking. However, this can be stepped up a notch and a glowing table can be easily created. All that is needed is some glow in the dark paint and the table will definitely stand out from the rest. This is a great project for a family since kids love these types of tables. The great thing about woodworking is that enables anyone to create items that solve genuine problems in the home. Many people have too many clothes and not enough storage space. A DIY wood clothes rack is extremely simple to make and will create as much storage space as is needed. Shelves can also be easily be made and the circle wood shelf is a different and interesting spin on this common item. This sort of project creates a classy look and is almost effortless to create. It is basically wood shaped into a large circle with three or four shelves running from one end to the other. If there is a “man cave” in the house, then a DIY bottle opener is a must. This is basically a bottle opener that is attached to a short plank of wood with a container at the bottom to catch the caps. These are just a few DIY wood projects for beginners. The types of projects that can be made are simply limitless and all comes down to personal preference and imagination. Woodworking is truly an amazing hobby that can even become a profession if so desired.